Especially when you’re filming yourself…a million ideas, and thoughts are going to be running through your head. So to make sure you stay on track write yourself an outline of the video you’d like to create. That includes a script or basic outline. For me personally, I write an entire word for word script and summary. However I don’t memorize the script as for the most part I start thinking of additional things to say when I start filming. I do refer back to it to make sure that I have roughly said everything I want to say but overall I never say it word for word. If you have an amazing video idea to involve B-roll footage and film yourself talking…always complete your talking points first. I always find the B-roll footage to be very easy to capture but for some reason I always push off speaking in front of the camera until the last minute. So avoid this back and forth in your own brain and shoot your talking points first. This I’m still trying to master as sometimes I feel really silly talking to the camera by myself. However, practice makes perfect. Even better practice in front of the mirror first so you can see yourself talking. Then take it to the camera. The more you practice the more you’ll get over your fears. Like I said above stick to your script and outline. That doesn’t mean memorize (trust me if you try to memorize it will only make filming yourself WAY MORE FRUSTRATING). This means to refer back to your script and outline to make sure that you’ve captured everything you want to capture for the video. The worst thing to happen is you get home only to realize you forgot to film a major part you wanted to include in your video. Try not to film like everyone else. Make sure that you push yourself creatively to get those interesting angles or shots. Best way to be creative is to look on YouTube. I couldn’t tell you how many times I have turned to YouTube to find a new idea of a shot I could include in my video. A lot of the time I take the idea I saw and add a spin to it or add something to make it different while I am editing. Don’t forget this is your idea and vision. So, relax and enjoy making it. You’ll only be more frustrated with yourself in the end if you rush the process. Definitely eat something before you start shooting. The worst thing is stopping before you’re finished because your stomach starts grumbling. Now I’m not saying completely avoid it, I’m not crazy. However I will say to downgrade your Venti Cappuccino for a Tall Cappuccino one instead, as you don’t want to find yourself super jittery before and during the shoot. Do you have your SD card? Are your batteries (yes have at least 2) charged? Are your lenses cleaned? Is your tripod packed and ready to go? Whatever camera gear you’re planning on using make sure that it’s all working and ready to go before you start shooting. Now you’re almost ready to shoot! Make sure that (with your outline) you set up the different angles that you want to capture. Also, make sure to double check that everything is steady and secure. The worst think that could happen is a huge gust of wind knocks over your tripod, with your camera attached, and your camera falls onto a bunch of small pebbles causing your lens to crack (speaking from experience). Whether you decide you manually want to set up for camera settings or keep them on auto. Make sure that you decide before hand and set them appropriately. So you’re ready to start, right? Well, just to make sure everything looks good…do a test run for 30 seconds. Make sure your sound is okay, your lighting looks good, and your camera is leveled on your tripod. You’ve officially finished the hard part! Filming yourself and the little extras for your video are the hardest part of the process. So sit back, put your feet up, and relax a little bit. Once upon a time I didn’t back up an SD card, and within 2 hours of the shoot ending I found myself retracing my steps on the side of a mountain trying to find my SD card. Now this is a bit of an extreme situation BUT it happens to me, happens to other professional videographers, and yes it can happen to you. So I always suggest immediately downloading your footage. If you are going to a location, bring your laptop with you and download the footage once you’re done. It seriously only takes a couple minutes and you will thank your future self. Also, don’t forget to double back up when you get home (I have another story about that later). I said the hard part was over right? Well, not completely. I really think the best part of creating a video is the editing part as this is when you get to see your work come to life. So sit back, grab some coffee, and open up your editing software. That’s it! Those are my top tips, tricks for you to start filming yourself. Sounds easy right? Well, luckily I created a downloadable guide for you to download right to your phone! 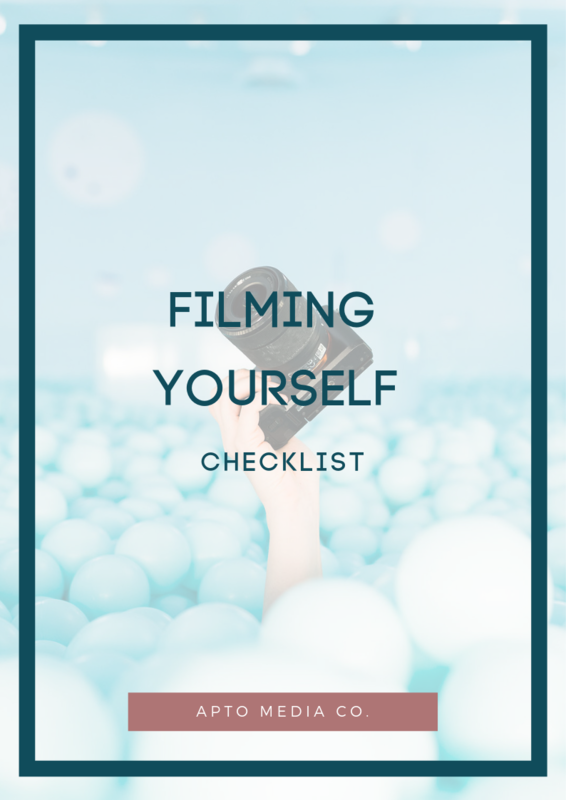 If you have any questions, or you used this guide to start filming yourself…please let me know in the comments below. I’d like to hear from you and share your success story on Apto Media’s social media platforms.